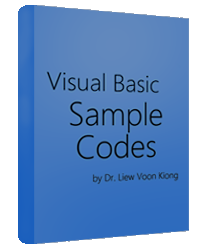 This is a Visual Basic program that can plot the path of a projectile, the basic concept of missile launching. This path is determined by the launching angle and speed. The formula is y=(Vsin a) t- 1/2(gt2) and x=(Vcosa)t, where V=launching speed and a is the launching angle, g is acceleration due to gravity(9.8n ms-2) while t is time. In this program, we use a picture box for drawing the curve . The command Pset is used to plot the curve. Pset is a method that draw a point on the screen. Using loop such as the do loop will connect all the points into a line.